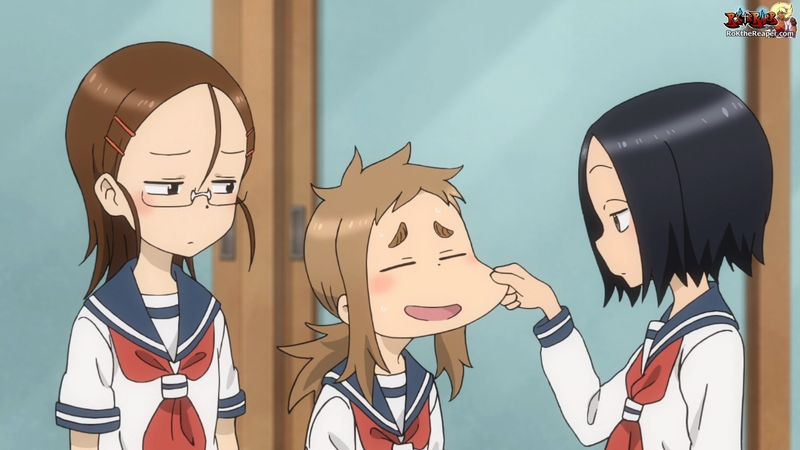 Karakai Jozu no Takagi-San made a pretty good 1st Episode Impression on me from the interactions between the main characters. However, I often find that animes can start off good and be bad later on down the line. I managed to finish the entirety of the 12 episode series and decided to do my review as I have always done! Below you are going to find my breakdown of the Story/Plot, Characters, and giving you my final impressions of the anime. The entire premise of this story is that Nishikata wants to get back at Takagi for teasing him every single day. Sitting and thinking about it, he plots various ways on how he could tease, embarrass and otherwise humiliate her for always getting the better of him without a successful way to counterattack (in fact, every episode is named primarily over the central themes of that section). However, it always appears as if Takagi knows exactly what he is thinking and generally foils his plan by either doing what he wants to do (only better) or simply responding in a way that flips the situation within her favor. Though, it becomes quickly apparent that this teasing is not bullying but rather out of affection. Nishikata is only focused on getting back at Takagi without releasing just how much she actually likes him, though it is painfully aware that she can tell Nishikata’s feelings for her, even if he is not quite sure about them himself. The whole plot of the story is rather simple, but it works in a slice-of-life anime in which a budding middle school romance is the center of attention. As an adult, we often joke about how children teasing someone excessively usually means that they like them and want a way to communicate and interact while sparing the embarrassment of admitting they are special to you (at this age they are usually made fun of by other kids for doing so, or at least teased about it). In the case of Nishikata, he seems to breakdown when saying anything remotely related to probably liking her, though making it painfully obvious because of his reactions. Takagi on the other hand, lays it bare but can quickly retreat behind her teasing and joking to mask it off as purposely rousing Nishikata. 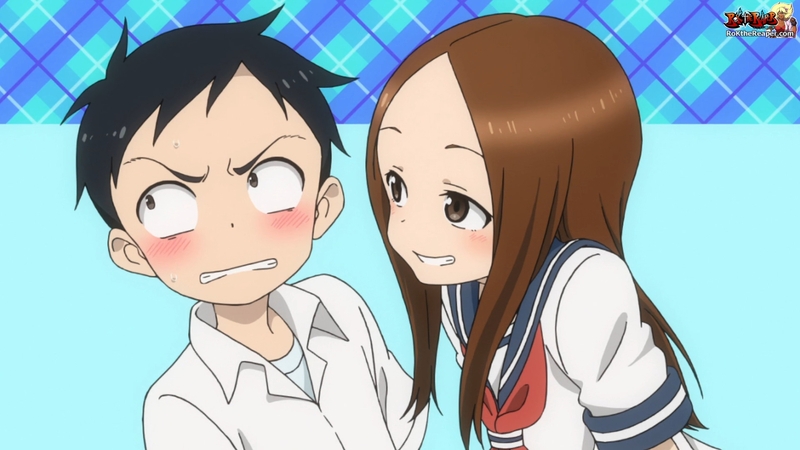 I feel the way the characters handle things creates a type of teasing to the audience in the sense that you want to know if anything will become of it in the end; Takagi gets more bold with her words and actions while Nishikata becomes self-aware of his own feelings when it comes to her…but we want to know if something will transpire above just friendship. One thing I did really hate about the direction of the story is that it feels as though no real ground was covered over the entire 12 episodes the anime was going. Sure, if we get a season 2 it is definitely something I would watch because I would like to see how things play out from that point forward…but as of now with the end of season 1, it feels as though we got a small tease if nothing else. We can pretty much confirm the relationship between Nishikata and Takagi from their interactions and reactions in both the presence and absence of the other. To be perfectly honest, you have a variety characters present within this anime; though the main ones are Takagi and Nishikata (obviously), but there is a second set (to which I will get into in a bit). As the protagonists of this anime, they take center-stage and their actions and characteristics add to the plot. First off its Nishikata, someone who is apparently of average intellect and is pretty much your average middle school boy. From what I can tell, he is into anime and manga (though shoujo, but I really like Sailor Moon so I’m not one to talk), video games, and does not care for school all that much. It is apparent that girls interest him and he is not very good at hiding his emotions due to being an open book when it comes to them. Nishikatas actions are the one thing that apparently fuels Takagi, and he cannot help but laugh when he feels the urge or to think up very good plans for retaliation. I did not find Nishikata to be a cool or likeable main character, but the one thing he nails 100% is being relatable, which is what I think his selling point it. There is obviously not too much special about him in the ways of academics, sports, or side activities…but that does not really stop him from living his day-to-day life. Takagi makes up the entire anime, she is the leading lady and the essence of way this anime is so good and warm-hearted. She is obviously very smart and intelligent, able to read Nishikata like a book and quickly figure out any plot from being observant of her surroundings and reading the atmosphere. Seeing how kind Nishikata is and loving his reactions, it is wise to infer that she ends up liking him from their initial meeting and as they spend time together. One thing that is often made plain to see, which Nishikata happens to be ignorant of, is her affection for him; this is expressed by walking home together, helping him to clean the school (either by waking up early or staying late), or her mood immediately going down if the fear of not being around him comes up. You do have side characters, however, they are more of the “in the background” scene than anything else. While some side characters choose to promote the main characters into doing something, causes some type of incident, or are those who help to resolve an issue…no one in this series happens to do any of that. In fact, all of the side characters seem like they only exist to prove that there are more people that our protagonists can interact with instead of just each other, so no one is really memorable outside of those who are given constant screen time due to their lack of presence and impact. To be honest, the characters themselves are fine but they actually all fall flat without Takagi being the main pillar that holds this anime up. In fact, Takagi is actually in the name of the anime and it is for very good reason, she is simply adorable in every sense of the word. I feel like they designed a good main character, though I would have liked to see a tad more boldness in Takagi’s actions to see if Nishikata would react if she actually crossed the line a few times, but she did her job well…just the main male character was made entirely too dense to properly get the reactions we had to wait nearly the entire anime to finally see (The end of the last episode for instance). Besides the everyday happenings of Nishikata and Takagi, we have are treated to a trio of girls who we also follow named (from left-to-right) Yukari, Mina, and Sanae. They are frolicking along in their everyday school lives and seem to be just a regular group of friends, I have no idea why we even put a spotlight on these three besides to stretch out episodes or to give us a break from the antics of Nishikata and Takagi. Each of these three possess very different personalities, but that what also makes the group tolerable while waiting for more goodness from our main characters. Yukari is the smart one out of the group and seems more concerned about her future in regards to academics and romantic relationships. Mina is the hyperactive one and the most childlike, she is bubbling with energy and often wants to give the appearance of an adult despite still enjoying her youth in the way any normal school girl would. Sanae is often seen as quiet and expressionless, though she has bursts of emotion and goes along with whatever Mina suggests in a hearty fashion that is a direct contrast to her appearance. To be honest, i do not mind these three and I happen to like the entire trio (except for Yukari, though Sanae is definitely my favorite). While they do not really add to the anime, they do not detract from it either and are likeable enough to get a pass from me on their inclusion in regular episodes (as we usually get at least one segment dedicated to whatever they are doing). 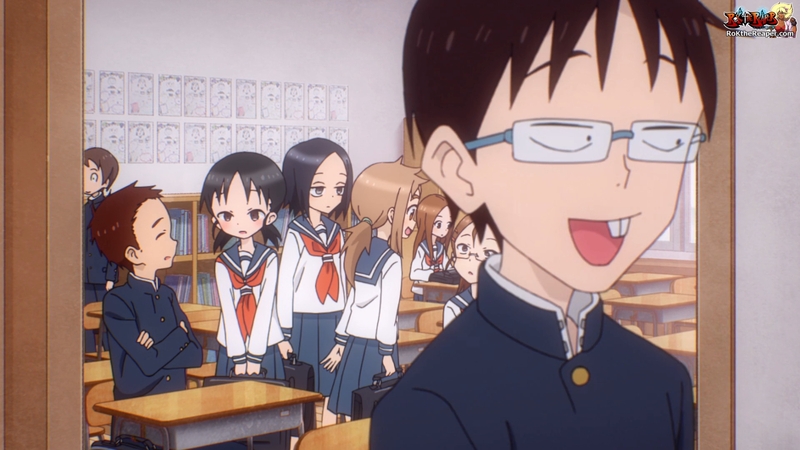 STRENGTHS — Takagi-San is an amazingly cute character, The interactions of Takagi and Nishikata is adorably heart-warming and gives a nice representation of a budding middle school romance, Nice use of warm colors for a light aesthetic, The “main” side characters have their own charm which differentiates from the protagonists. 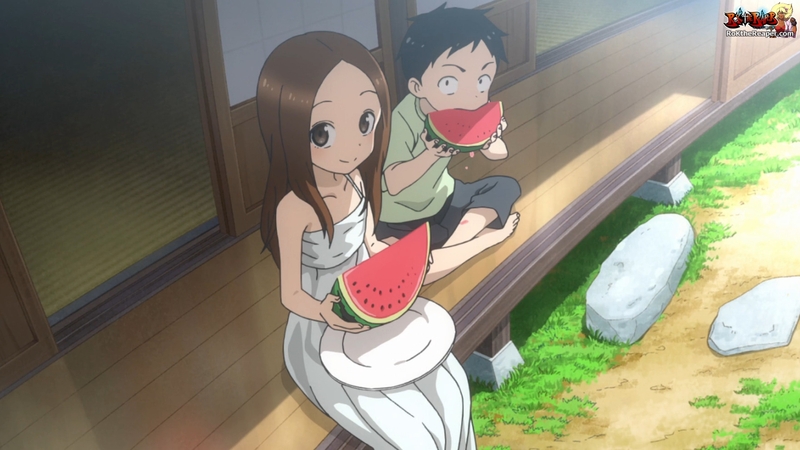 WEAKNESSES — The anime allures to something “more” but never delivers, Nishikata’s lack of awareness is sometimes frustrating, Takagi can come off a bit too teasing at times where it feels being genuinely sweet would result in a better feel. 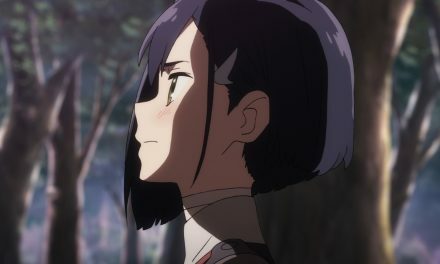 IMPRESSIONS — I had no idea what to expect when I decided to add this anime to my queue, but it quickly became one that made me smile numerous times without me knowing as I watched it. The interactions between Nishikata and Takagi are cute and show an innocence in displaying affection only seen when you are younger. This anime’s plot was very simple in its dynamic and its execution, but it does so in a magnificent way that is sure to bring a heartwarming experience to those that are looking for a more pure, uncomplicated slice-of-life anime that is filled with pure interactions between a future a couple. I recommend this anime for anyone that is looking for a simple romcom (to a degree) with childish innocence and an adorable little leading lady. I guarantee those of you who watch this anime will not be disappointed if you have a frigid heart heart that needs warming. PreviousDevil May Cry 5 — Gamescom 2018 Trailer, Press Release & Screenshots!